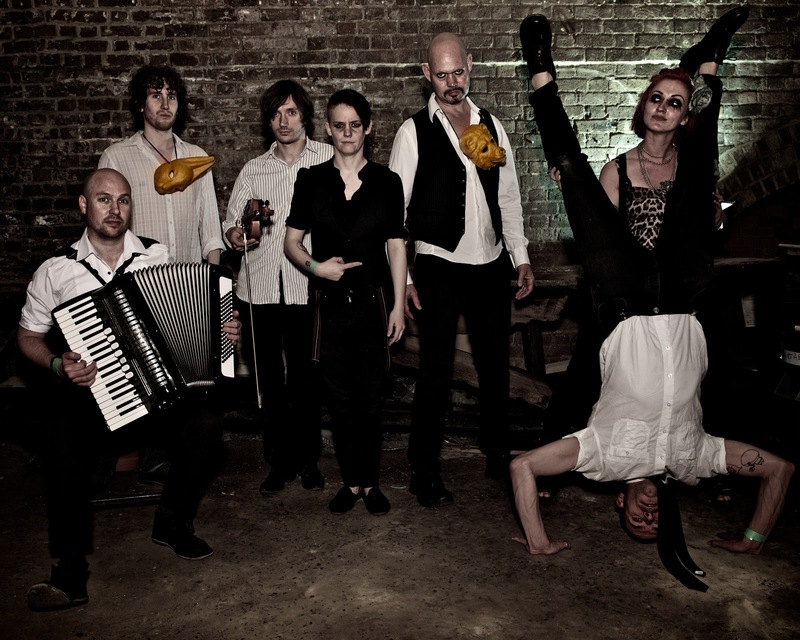 Here come Hackney’s irrepressible folk-punks The Great Malarkey, bringing you their unbreakable kitchen-sink fusion of riot-torn r’n’b, urban skank and swaggering street ska and anything else that takes your fancy. Just so long as it makes your feet move. In-your-face street-corner speechifier Alex Ware and her marauding septet hit you not once but ten times with their tailormade floorfillers in little more than half an hour, scarcely allowing a moment’s breathing space, other than for the occasional moment of bottom-of-the-glass reflection. Their ethos? Get in, get out and leave a heaving mass of happy, drooling, knackered revellers! Drawing influence from such culturally diverse and mob-handed ensembles as the Pogues, Mano Negra and Fanfare Ciocarlia, with a twist of Tom Waits for good measure, joining Alex in the band are drummer Joni Belaruski, Jason Nash on accordion, Alex Newton on trumpet and Owen Evans with his banjo and guitar. A fiddle was always going to be necessary, and Aidan Banks was only too happy to oblige. The last to join the ranks was Jake Appleby: a man of few words, but he plays the bass like it owes him money. From an early barnstorming start supporting Toots & The Maytals at just their third gig, the Malarkey-mobile has taken them from guerilla gigs around the capital, up and down the length and breadth of the land and overseas too, from dive-bars to festivals, both habitats seemingly their natural home. Already this year they’ve played Boomtown, Bestival and Bearded Theory. A pound to a penny, Badly Stuffed Animals will find many admirers, allowing the band to winter in sundry smoky dens of iniquity, ready to take to the open air once more in Spring. Badly Stuffed Animals is out on Clearcut Records on Monday 5 November. They launch the album on Saturday 3 November at Passing Clouds, Dalston, London. Come one, come all! with us as we venture into your next big hit!